Abstract: Recalibrating the environmentally damaged earth has never hit as breakneck pace as it has now with the Carbon Capturing and Storage (CCS) plants. This article is a blind taste test for the trade-offs and spin-offs of CCS as opposed to its expensive measurement in the developing countries. The world digested around 8.4 billion metric tons of greenhouse gas (GHG) in 2014 through burning of natural gas, coal, and oil causing a 90% increase in carbon-di oxide (CO2) emission since 1970 (EPA, 2017). Around two new coal-fired power stations are being opened every week in the developing countries and the global emission is topping at 40 billion tons of CO2 every year (Plait, 2014). This is an extremely alarming rate to challenge the promise of Kyoto Protocol, i.e., to reduce GHG emissions by 5% comparing with the baseline year of 1990. Lately the polluting countries are leading the fight against GHG emissions and the most recent is the plan to build carbon capture and storage (CCS) facilities. The schematic process involves arresting wasted CO2 from fossil fuel sources and transporting it to a storage site as an underground geological formation. Sometimes, the disposed unit is used as fertilizer to grow crops in greenhouses. This is a comparatively new tool to mitigate the adverse effect of fossil fuels, F-gases, and ocean acidification. The “negative emissions” of carbon removal and storage coupled with drawing down fossil fuel is a way to stop the long-term buildup of GHG in the atmosphere. One such plant can capture about 400,00 to 800,000 tons of CO2 every year which is equivalent to the reduction of CO2 emitted by 80,000 cars per year (Dom Galeon, 2017). As the developing countries will continue to be resilient on fossil fuels to provide energy for continued industrialization, it is safer to store CO2 than discharging it into the air. However, CCS technology and its associated facilities that directly assault the climate pollution, is still in its infancy. The first commercial plant was opened in 2000 and now there are around 60 projects running worldwide. It has not been tested at a larger scale and there is an uncertainty that the technology cannot be scaled up in regards to the amount of CO2 emitted by the incinerators vs. the amount removed by the extractors (Evans, 2014). The CCS plants are too risky to be implemented in the developing countries as its operational expenses need to lay below $100 per ton for the technology to be scalable. Sometimes staking the future on CCS technologies may even pose a “moral hazard” as there is a risk that may allow regulators to think that weaning humanity away from fossil fuels is not urgent (Magill, 2017). None of the carbon reduction strategies alone can be the magic bullet to climate change. To secure low carbon footstep, developing countries will need to harness the CCS technology as more intermittent renewables and inflexible nuclear come onto the grid. From policy perspective, there is only one CCS Directive across Europe which requires consolidation of laws and regulation from different continents (CCS, 2017). 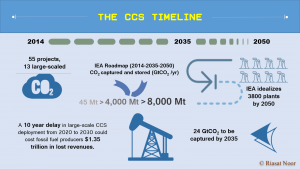 This is high time we formulated a synergistic platform for adopting CCS as one of the most effective tools for carbon reduction. 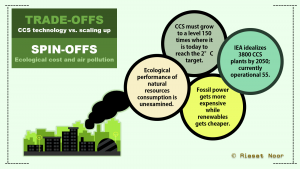 As fossil fuel is still the main steam for the developing countries and energy efficiency is expensive, CCS will be a way of continue using the dirtiest of fossil fuels without tipping the world into climate catastrophe.